Best known for breaking Babe Ruth's 60 homer season record, Maris found little pleasure in chasing the record. Many fans wanted his more popular teammate (Mickey Mantle) to break the record instead, and Commissioner Ford Frick got into the act by declaring that any new record would be marked by an asterisk if not accomplished within 154 games. Although his career numbers may not be as impressive as many of the greats, Maris was an excellent all around player who helped both the Yankees and Cardinals win championships. 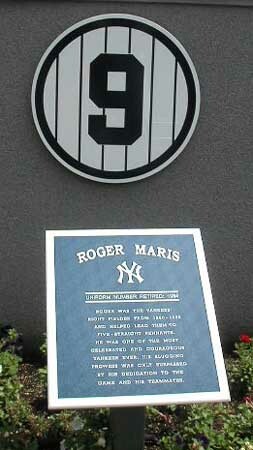 His number 9 was retired by the Yankees, and he is immortalized in Memorial Park.